They say anything is possible when you have a good friend to support you through tough times. 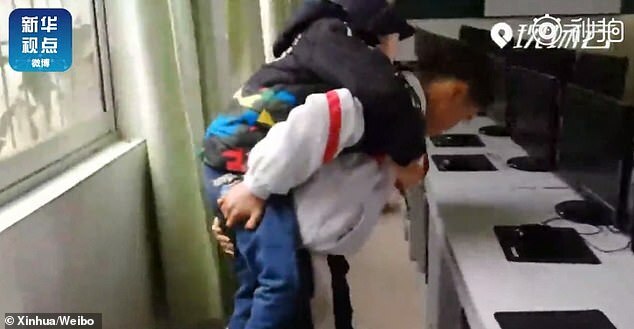 A disabled boy in China has been able to go to class for six years without a problem thanks to his classmate and best friend who piggybacks him every day. 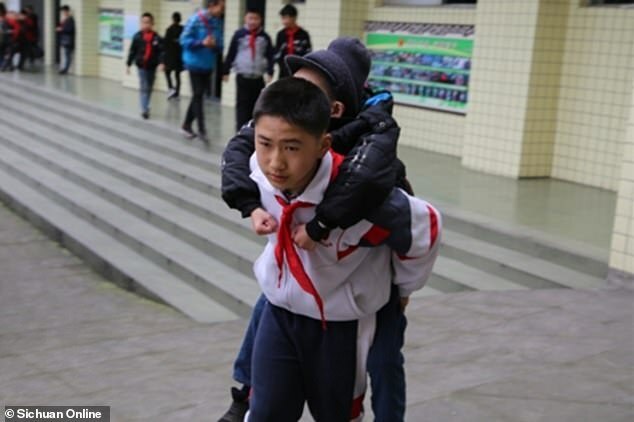 Xu Bingyang, 12, carries Zhang Ze to school come rain or shine. The kind-hearted boy also helps his friend to fetch lunch and move between classrooms to attend different lessons. The beautiful friendship between the two children from Meishan city in south-western China's Sichuan Province was reported earlier this month by Chinese news outlets, including Sichuan Online and Xinhua. Xu, who is much taller and stronger than Zhang, told reporters that it was his pleasure to be his friend's 'walking stick'. He added that it wasn't difficult to lift Zhang. 'I weigh more than 40kg (88 pounds) and Zhang Ze only weighs about 25kg (55 pounds), so it's okay for me to carry him,' Xu said. On the other hand, Zhang said he couldn't thank Xu enough for his benevolence. 'Xu Bingyang is my best friend. Every day, he studies with me, chats with me and plays with me. [I] thank him to look after me like this every day,' Zhang told Sichuan Online. 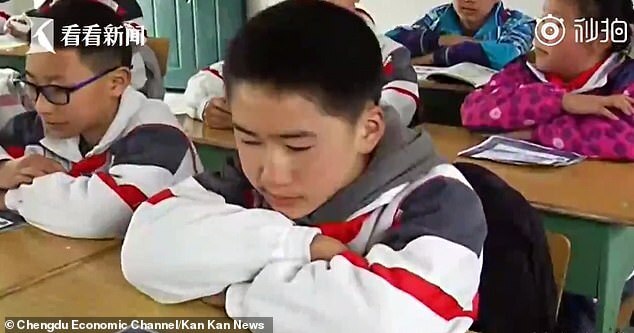 Xu and Zhang are sixth-grade pupils at the Hebazi Town Central Primary School in the county of Qingshen. Zhang was diagnosed with a rare muscle condition, sometimes known as the rag doll disease, at the age of four. 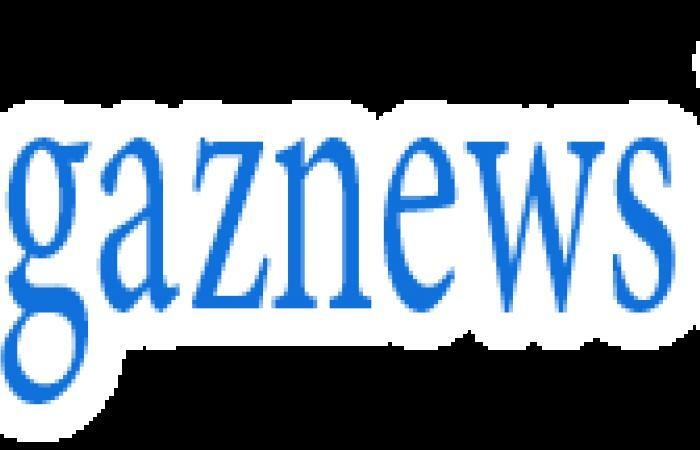 The incurable condition, officially called myasthenia gravis, caused Zhang to lose all control of his voluntary muscles in his legs. He cannot walk on his own. Fortunately, Zhang has been able to go to school like other children after Xu offered to help him as soon as they met in the first grade.